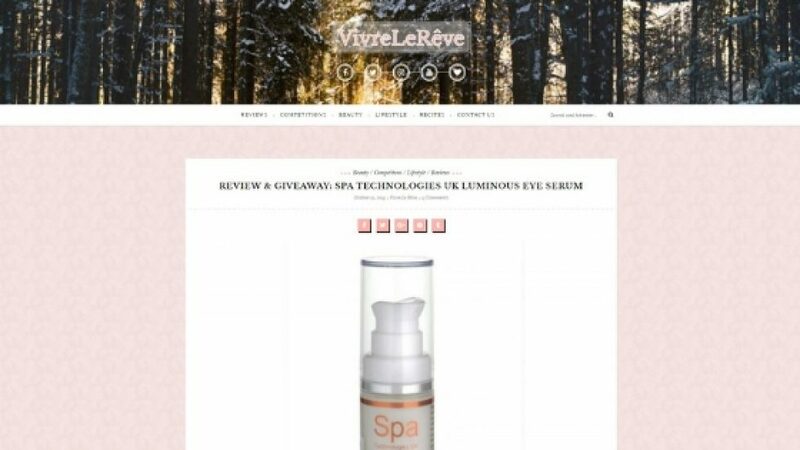 Vivre Le Reve has reviewed our amazing Luminous Eye Serum and loved it so we decided to collaborate with them and offer their readers the chance to win a Luminous Eye Serum . Luminous Eye Serum retails at £35 and is formulated with natural ingredients and powerful active ingredients that will diminish wrinkles, fine lines and dark circles and increase luminosity and firmness. Bring back the youthful look of your ! Competition closes at 12am on 18th December 2018. Entries received after this time and date will not be entered into the draw. The prize is Spa Technologies UK Luminous Eye Serum. ”Firstly, this is my new favourite eye cream, it’s a rich serum designed to improve the look of your eyes. It will help decrease wrinkles and dark circles, will nourish and moisturise the skin around the eyes. Formulated with only natural ingredients it is extremely gentle for even the sensitive skins and will increase luminosity, firm skin and help reduce wrinkles and fine lines.